Nutella is my weakness. It started at an early age...I can't remember when I first came across it but I remember one birthday when Mum gave me a little jar instead of chocolates and I was allowed to have one spoonful a day. Talk about a lesson in patience and self restraint. Imagine my delight when I hit high school and our Tuck Shop (yes, it was really called that...I swear I didn't go to school in the 1940's!) stocked those tiny little Nutella snack packs that came with the plastic paddle instead of a spoon. My whole year level went a bit Nutella crazy...the shop usually sold out by the end of first recess. But, so wide spread was the addiction that some of us would buy up in bulk at the beginning of recess, and then wait for the 3pm sugar cravings to hit the other classes. Thus our `Nutella Black Market' was established...we were selling those snack packs at three times the regular price out of our lockers...it was quite lucrative whilst it lasted! 1. Place ingredients for dough into bread-maker in the order listed above & set to `bread dough'. My bread-maker is the Breville Ikon (BBM600) but it's a few years old now. 2. Roll dough into a 40 x 40cm square. Brush with the melted butter & spread Nutella on top. Don't go crazy (I know its tempting! 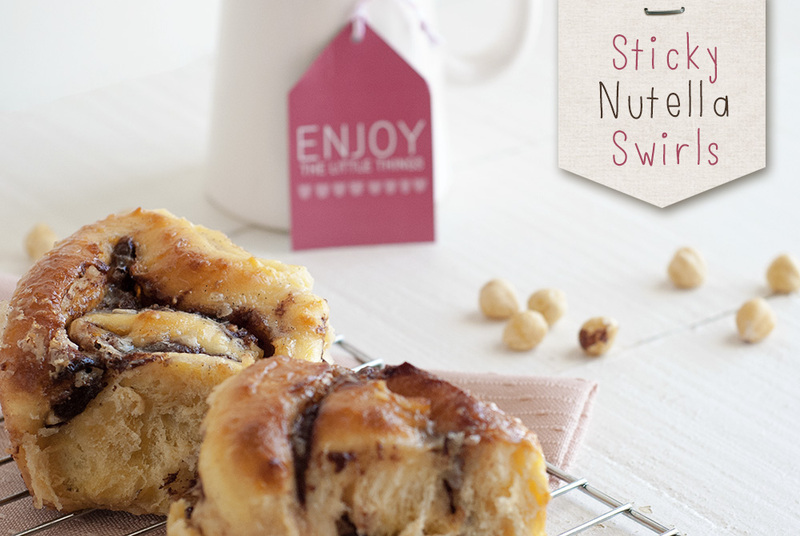 )...and aim for an even spread so you don't have pockets of Nutella vs. no Nutella in the swirls. My dough came out a bit softer than usual so it wasn't easy to spread but it just dolloped a bit on here and there and tried to even it out a bit. Sprinkle sugar and hazelnuts over dough. 4. Place slices about 5cm apart on a lightly greased tray. If your dough is super soft and is not going to stand up nicely, you can use casserole dish or similar with higher sides. Cover loosely with lightly greased plastic wrap and stand in a warm area for 20 minutes or until dough has doubled in size. Remove wrap. 5. Bake in a pre-heated oven at 180C (350F) for 20-25 minutes or until golden brown. I'm still figuring out when the perfect time is to remove these from the oven. My first try I left it too late and my second try a bit early so be prepared to experiment a little bit as all ovens are different! 6. Brush with gelatine glaze whilst still hot, then drizzle with vanilla glaze. I'm a bit sad the above photo wasn't all glossy with glaze because I ended up putting mine back in the oven for a little bit after the glazing process!